This two-CD set from Lyrita comprises quite a rare mixture of British composers, all who contributed immensely to the chamber and song genres during the last 80 years. With the exception of Lennox Berkeley, and to a certain extent Hugh Wood and John McCabe, who are both still very active, the other composers are most definitely off the beaten track. I found the music of the only woman-composer on the programme meaty and complex; indeed Priaulx Rainier's "Quanta" and String Trio hold their own quite easily when compared to the other pieces on this issue. 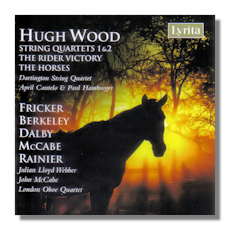 In fact the first disc is dedicated wholly to Hugh Wood's output, and although his language is often terse and atonal, his lyrical vein is very evident in the 2 song cycles on this programme. Berkeley's Duo and Fricker's Cello Sonata are similar in style and content, and both pieces are highly expressive and virtuosic making them totally accessible. The Dalby and McCabe creations both date from 1966 and they are both punctuated by an element of contrasting tensions and snowy sounds. Performances are flawless, but sound quality, although generally good, occasionally shows its 30-year age. All in all, an excellent showcase of British chamber music from the last half century.